Kerber would now face the former world no. 1 Victoria Azarenka in the quarter-finals. 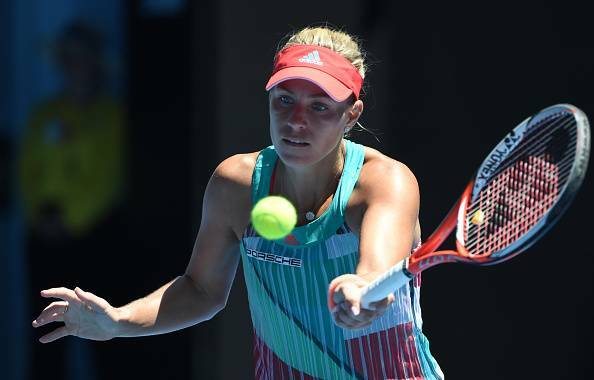 Seventh seed Angelique Kerber fought through a tough opening set but cruised through the second to defeat countrywoman Annika Beck, 6-4, 6-0 and reach the quarter-finals of the Australian Open tennis tournament for the first time in her career here on Monday. She next faces former World No.1, two-time Australian Open champion Victoria Azarenka, who had her toughest match in the tournament thus far but took out Barbora Strycova 6-2, 6-4 in her fourth round match. Already in the fourth round of a Grand Slam for the first time since the 2014 Wimbledon, Kerber faced a tough opposition in Beck. "I want to congratulate Annika first; she played an amazing two weeks and she got to the fourth round, so well done to her!" Kerber said after the match. "She has a good future, but it was a tough match. The first set was very close, three breaks, so I was trying to stay in the match, try to be aggressive and take my moments. I was happy I won the first set and tried to really be aggressive in the first few games in the second set." The win wasn't easy for the German, who was match point down in her first round against the talented young Japanesewoman, Misaki Doi. "I had one foot on the plane back to Germany, but I'm very happy to be in the quarters for the first time. It's really great playing here on Rod Laver Arena and the other show courts."